Our instructor, Erin Mae Lewis, has a new lesson series for Chromatic Mountain Dulcimer, using the familiar fiddle tune, Soldier’s Joy as example to demonstrate how to play this tune in several keys! Subscribe to DulcimerCrossing.com and you’ll have access to the whole lesson series! While on tour in southern California in August, DulcimerCrossing instructors, Erin Mae Lewis and Steve Eulberg arrived early for their gig, Peter Alsop’s Kids Koncerts (Dulcimer-Wellcimer) at the “magical treehouse” of Will Geer’s Theatricum Botanicum. Erin took these photos as we prepared for the pre-school kids concert on Sunday morning. As Erin relates in this highlight video from their recent Concert Window show, Steve was playing this new composition, inspired by the setting, during the sound check for his guitar. She came to the stage from the second floor green room and joined in to complete the tune, which they named for the location that inspired it. This Highlight Video will also be available on the Live Events page at DulcimerCrossing.com. Erin Mae Lewis, who teaches Chromatic Mountain Dulcimer Lessons on DulcimerCrosing is giving a special Chromatic Mountain Dulcimer Workshop! Here is another resource for mountain dulcimer players! Wayne Jiang and Patricia Delich, the producers of the Hearts of the Dulcimer DVD, have created a regular Podcast, called Hearts of the Dulcimer. 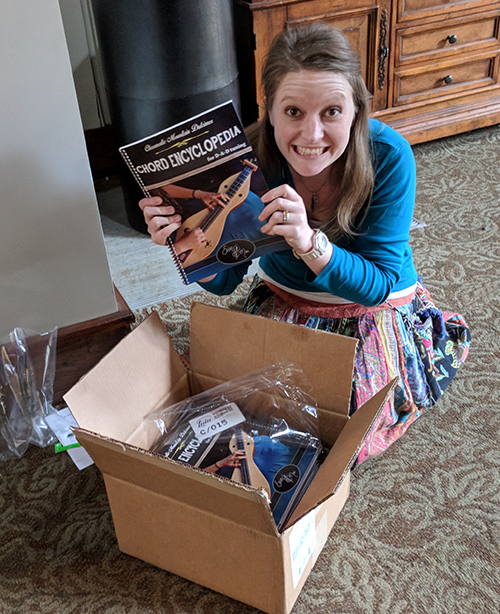 The most recent episode (#007) features our own DulcimerCrossing teacher, Erin Mae Lewis, not as a Bond girl, but as the Secret Agent of Dulcimer herself! Each episode features several explorations of the dulcimer, its history, its players, its past and its future. This episode features the playing of Erin Mae, together with her sister, Amber (from their duo Scenic Roots) and a surprise jam session with Steve Eulberg at the Kindred XL Gathering in Jughandle, California August 2014. 1. Click the photo of Erin playing, or follow this link to the Hearts of the Dulcimer Podcast page. Subscribe to DulcimerCrossing.com to explore Erin Mae’s lessons! Erin Mae Lewis teaches a new lesson on the skill of playing what she calls “forward” and “backward” scale patterns. This is what she uses to move her scales all over her chromatic mountain dulcimer, enabling her to playing the “string-band” keys, as well as the “singing” keys and helps her be not only a welcomed player, but a sought-after player for bluegrass jams sessions! Her tips will definitely help you, even if you are playing standard mountain dulcimer only. Subscribe today to have access to ALL of Erin’s lessons!